You know when you make something and when you try it, it blows your mind how good it is? 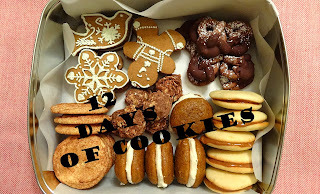 That's what happened with these cookies. 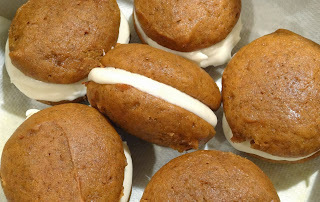 I had a special request for whoopie pies of some kind, so I started trying to come up with just the right recipe. I had an idea for what I wanted, but nothing was quite hitting the mark. So I compared and combined a number of different recipes, added my own twist, and came up with this resulting amazingness. The cookies are really more like a pumpkin cake than a cookie. Soft, fluffy and oh so moist. The whipped maple cream cheese frosting gives that wonderful cream cheesy flavor with a subtle note of maple that will knock your socks off. Adding in the whipping cream lightens the whole thing and makes biting into these cookies like biting into a cloud in pumpkin heaven. All kidding aside, these cookies are dang good. Just don't forget to add the pumpkin like I (almost) did. As a side note, one large (29 oz.) can of pumpkin puree will make one batch of these cookies, one batch of these rolls, AND this dessert! Preheat oven to 350. Prepare baking sheets with parchment paper. Sift together flour, baking powder and soda, cinnamon, ginger, cloves, nutmeg, and salt. Set aside. In a separate mixing bowl, cream together oil and brown sugar. Mix in the egg, pumpkin, and vanilla. Add in the dry ingredients in two parts, mixing until just combined. Use a small ice cream/cookie scoop (1 Tbsp) and drop onto prepared baking sheets, about 1 inch apart. Bake about 15 minutes. Cookies should be springy to the touch. Let them cool completely on the pan. Meanwhile, make the filling. Cream together the butter and cream cheese. Mix in the vanilla and maple syrup. Add the powdered sugar. Beat in the whipping cream until the frosting becomes light and fluffy. (It will be runnier than you'd expect at this point.) Chill for at least 20 minutes. Filling can be made a day in advance. To assemble the whoppie pies, transfer filling to a pastry bag and pipe a large dollop onto the flat side of half of the cookies. Sandwich with remaining cookies, pressing down slightly so the filling squishes out to the edges. Cover and refrigerate another 20 minutes before serving, or up to 3 days.